Coined by Charles Darwin, the term “living fossils” is used to describe living creatures that have stood the test of time — hardy and resilient organisms that have remained largely unchanged for millions of years. Here are some of of the most incredible examples of nature not fixing what ain’t broke. To be clear, “living fossils” is not a scientific term per se, and there’s no consensus on a formal definition. But for the purposes of this article, we’re going to define a living fossil as an ancient species that (1) hasn’t gone extinct, (2) has not produced, or “radiated,” many new species (i.e. low taxonomic diversity), and (3) has remained relatively unchanged over the course of millennia. On this last point, that’s not to suggest these animals haven’t stopped evolving (which is a kind of myth associated with living fossils). All organisms, no matter how old, have continually adapted to changing environments, including rising and falling temperatures, changes in atmospheric composition, and other novel conditions. But for the most part, these species have settled on environmental niches in which morphological forms and behavioral modes haven’t required a lot of tweaking. In many cases, they’ve attained a fitness peak in environments that continually reinforce a certain physicality. Though not often considered a living fossil, cyanobacteria have been kicking around for practically forever and will continue to do so well into the future. In fact, like many other strains of bacteria, they’re one of the most successful groups of organisms this planet has ever seen, and include some of the first life forms to evolve on Earth. Stromatolites — layered structures formed in shallow water by the trapping, binding, and cementation of microorganisms, especially cyanobacteria — provide the most ancient records of life on Earth dating back an astounding 3.5 billion years. Image stromatolites in Shark Bay, Wikimedia Commons. But if cancerous tumors are not our great-grandparents, these guys most certainly are. 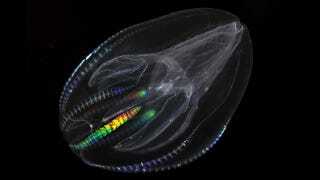 Also known as the comb jelly, ctenophores first emerged 700 million years ago. They look like striped jelly blobs that flit through the sea propelled by rows of cilia. Biologists say these are the oldest known animals — and not sea sponges as previously believed — meaning we’re actually descended from these things. And most remarkable of all, as a living fossil, they’re still kicking around. We used to think that coelacanths went extinct around the same time as the dinosaurs, about 65 million years ago. But their “re-discovery” in 1938 off the coast of South Africa reset our notions of how durable some species truly are. Coelacanths have been traced as far back as 80 million years ago, and were at one time a large group comprising about 90 different species. Today, there are two known species living in populations that have been separated for at least several million years. Located off the waters of Australia and New Zealand, elephant sharks, or Callorhinchus milii, are members of a branch of cartilaginous fish known as chimaeras. They’re distantly related to sharks and rays, so technically speaking they’re not actually sharks. Recently, scientists mapped the genome of this creature, revealing DNA that’s barely changed for nearly 420 million years. To put that into perspective, dinosaurs didn’t emerge until the Triassic period, some 230 million years ago. Owing to this new analysis, elephant sharks are the slowest-evolving vertebrates we know of. Crocodiles have a good thing going. They’re basically the killer app of predators — creatures that rest in water bodies waiting for their prey to come to them. Cuz eventually, everybody’s gotta grab a drink. It’s an evolutionary strategy that’s worked for millennia (I often like to think of the various animals crocodiles have feasted upon — from ancient lizards and dinosaurs all the way up to modern mammals). Descended from marine super-predators (of course), they made their first dreaded appearance some 55 million years ago. Today, saltwater crocodiles are the largest of all living reptiles and are the largest terrestrial apex predators in the world. Horseshoe crabs are the quintessential living fossils. They look like something right out of an artistic rendering of the Cambrian Explosion. These atavistic creatures, which can still be found today crawling around muddy ocean floors, first emerged in the late Ordovician period some 450 million years ago. They resemble crustaceans, but they’re part of the Chelicerata subphylum, so they’re more closely related to arachnids, like spiders and scorpions. Despite surviving a number of mass extinctions, their numbers are now declining because of habitat destruction in Japan and overharvesting along the east coast of North America. The edible figs we eat today are produced on specialised female plants that trick the wasps into entering the figs and strip off their wings, but then prevent them from laying any eggs. As a result, the figs produce only seeds and no wasp offspring. The length of the ovipositor - the organ the wasp uses to lay its eggs - of the Isle of White fig wasp shows that its host fig tree had already evolved this method of cheating on its partner. Remarkably, fig wasps can travel further than any other insect, covering 100 miles in two days. Image credit: Robert F. Sisson/National Geographic. If there was ever a seed plant that deserves the title of “living fossil” it is the maidenhair tree, or Ginkgo biloba. The plant is native to China and has no living relatives. Fossilized leaf imprints of this tree have been found in sedimentary rocks of the Jurassic and Triassic Periods dating 135 to 210 million years ago — a time when dinosaurs still roamed the earth. The unique, fan-shaped leaves and naked seeds of living Ginkgo biloba trees have changed very little in more than 200 million years. Today, when taken as an extract, Ginkgo biloba is used to improve memory and concentration. This eel was only recently discovered in a cave 35 meters underwater in the Republic of Palau. It’s so unlike other eel-like critters that it forced biologists to create a whole new family to describe it: Protoanguillidae. Analysis of the fish showed that it has evolved independently for over 200 million years, resulting in the retention of a large head, short body, and collar-like gill openings. In fact, some of the laundry list of different features are so primitive that they’re deemed older than the most ancient fossil remains, such as having fewer than 90 vertebrae. These marine mollusks have remained largely unchanged for 500 million years. They first appeared in the Late Cambrian period and became a significant group of sea predators during the Ordovician period. They’re the sole living cephalopods (a group that includes octopuses) whose bony body structure is externalized as a shell. And interestingly, they’re much closer to the first cephalopods that appeared 500 million years ago than the early modern cephalopods that appeared about 100 million years later. This is a bit controversial, but some scientists have proposed that cancerous cells qualify as living fossils — the last remnant of a crucial evolutionary juncture some 600 million years ago. It’s been surmised that cancer dates back to the beginning of multicellular animals, an evolutionary innovation that required cells to stop replicating independently and start coordinating with the rest of the organism. But according to Charles Lineweaver and Paul Davies, it’s cancer that’s our earliest animal ancestor. They suggest these organisms were the first to figure out some measure of control over cell replication, but they lacked more precise control over cell growth.